Monsoon Spice | Unveil the Magic of Spices...: Chitranna or Lemon Rice with Drenched Monsoon Memories!!! Chitranna or Lemon Rice with Drenched Monsoon Memories!!! It was first of June in early 90’s, one of the worst days for many school kids. It was the day when schools would reopen after two months of adventurous summer holidays. Dressed in new uniform with shining new boots and socks and cart load of new text books and notes on our bags, we kids would drag ourselves to school half heartedly. The thought of no more sleeping late at night and getting late in the morning, no more picnic lunches in mango groves and climbing the mango trees, no more sling shots and biting into raw or juicy stolen mangoes was enough to dampen our spirits. To top it all on every first day to school it would rain like it never rained before. It was one of those Monsoon Days, when heaven opens its door to the heated earth to bring down the high mercury level, giving it new lease of life. Although these heavy pours would cut down our out door play time, we kids loved playing in the rain and getting drenched from head to toe. Many a times we would ‘forget’ to carry our umbrella and come back home with slush mud covered boots and bucket full of water dripping from our uniforms. Sometime Amma would scold us and most of the times she would shake her head knowingly and rush us into bathroom. After leisure warm bath where half the time spent on splashing the water at each other and screaming at top of our voice, me and my sister would scrub ourselves dry with warm towel and snuggle into fresh cloths. Once dressed we would run to kitchen and sit on the long two wooden stools facing the kitchen counter and chatter non-stop telling our Amma everything that had happened at school. Amma would smile at us and make our evening snacks while listening to who got punishment for being naughty at school and how much we scored in our surprise tests. With in few minutes she would place two big steel bowls filled with evening snacks and steaming cup of coffee/Bournvita filled to the rim of steel glasses. One of my favourite evening snacks was Chitranna or Lemon Rice. It’s a simple rice dish more commonly made using left over rice from afternoon lunch or dinner. Sometime Amma would add few vegetables to make it healthier and colourful and usually she would add finely chopped onions to give it a nice crunch and sweet note. This delicately lemon flavoured rice was instant hit with me because of roasted peanuts tossed into it. I would hold the hot steel bowl containing lemon rice and let the steam rising from it tickle my nose. Aromatic curry leaves and crunchy dals in tadka is what makes it flavourful and the lime juice adds nice zing to it. And that gorgeous yellow colour from turmeric would well compliment the green colour from chilli and red roasted peanut with skins. This was one dish which added little sunshine to those monsoon days and proved once again that simple food is what comforts me the most during rainy days. Today while eating it from ceramic bowl instead of steel one and eating it with a fork in place of fingers, I can’t help but think of my childhood. The aroma, sight and flavour of this simple, down to earth Lemon Rice was enough to bring back a flood of drenched memory of monsoon days, my home and my Amma lovingly cooking it for two little girls in pig tails and big smile on their face. Amma, this is to you with all my love. 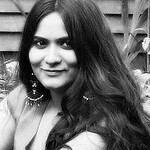 And this is my entry for lovely Nags who is hosting Saas, Bahu Aur Sensex Contest to celebrate spirit of Indian women. Cook rice with enough water and fluff it with a help of a fork so that each grain is separated. Keep it aside to cool. Heat oil in a pan and add mustard seeds to it. When mustard starts to pop and splutter, add channa dal, urad dal and halved dry red chillies. Sauté it on medium heat till dals turns light golden brown. Now add hing and curry leaves and saute it for few seconds. Add finely chopped onion and sauté it on medium flame till onion turns translucent, about a minute or two. To this add green chillies, turmeric powder and sugar and mix well. Add cooked rice, freshly squeezed lemon/lime juice and salt to taste and mix well till each grain of rice is heated through. Switch off the flame and toss roasted peanuts and mix well. Adjust the seasoning before serving hot with chilled Raita and enjoy. 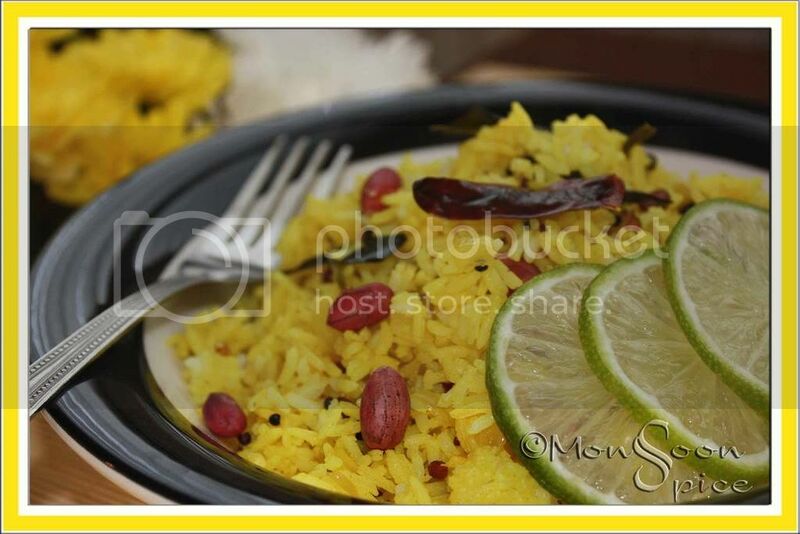 Gorgeous pics Sia :)Lemon rice looks mouth-drooling.Nice write up gal! So nice to read the post, reminds me of my time in school. In the raininy season we too was like that, always getting soaked to my mother frustration. I have never had this rice and i have seen a lot after starting blogging. Should make them once. Sia..Last month I searched your blog for chitranna recipe..now i got it. still waiting for vangi bath.. Your post brought back an 'almost memory' - I'm not sure but I think even we had a wooden bench in the kitchen to sit on! My son fav , he calls yellow rice and i make it pretty much twice in a week for his lunch box. As u said, we are digging in ceramic plate or bowl with a metal fork, this kind of confort food gets the satisfaction with only fingers :) Beautiful post dedicated to Amma! I make a version of this sometimes, but your post is making me crave this like never before. A lovely post..I'm smiling at the thought of pig tailed girls eating this and drinking bournvita! Very sweet..the best foods are the ones that have memories associated with them. And thanks for taking the time to visit me. i feel lemon rice tastes best wrapped in banana leaves and eaten in a moving train. those are my memories around this dish. Wonderful click! I love Lemon rice a lot!!! Lemon rice looking yum...one of the comfort food ;)..
thats so lovely!..i wonder how it is that all those simple dishes have so many memories attached with them...I cam imagine those two lovely little girls sitting and waiting for their food...:)..I am sure your amma would love reading this..
lovely prelude! simple easy to fix food! Beautiful post with nostalgic memories and colorful rice. Your post made me rem my school days. Returning home with drenched uniforms and treated to hot delicacies by mom. 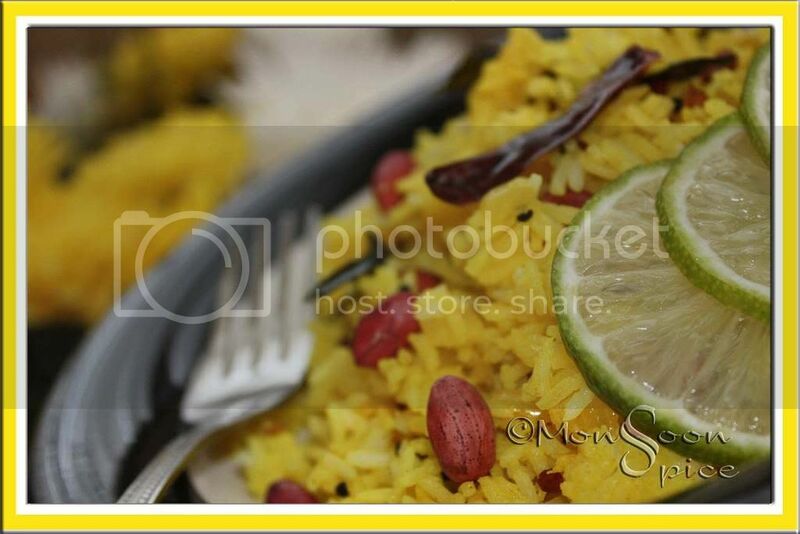 Lemon rice looks very nice and a lovely click! Love the way you write Sia.. lemon rice looks great. ok so i wont repeat wht everyone said..tht u reminded me of my school days....(gosh i actually repeated )but yeah it really brought back so many nostalgic things in my mind....remember those splashing in puddles on way back home?remember those little innocent prayers that we made to God ,for heavy rains,whenever there wud be class test..so that the school wud announce a holiday,remember those excitements when father dear wud come back from half way to office coz trains were cancelled due to heavydownpour,and he bringing some hot and spicy samosas and aluwadis from railway stn stall?We use to actually rejoice when currents wud go off ,and whole family wud sit together in candlelight ,listening vividhbharti(radio),chatting and munching together.....u know wht i pity kids of this generation..they no more have fun in those simple ways..atleast my son don't..
Beautiful post. Brought back my childhood memories.Lemon rice is my favorite too and it looks delicious. wow.. nice write up.. enjoyed reading your memories!!! 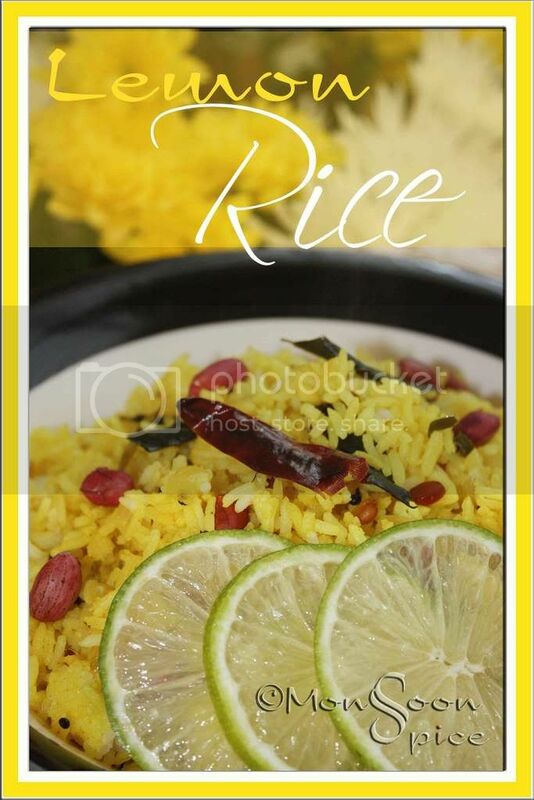 So many fond memories came alive with this wonderful post .thanks for sharing the recipe for Lemon Rice. Yum as ever - the picture:) I have always liked lemon rice, and it is a staple with me. Can you help me with putting bigger pictures in my blog? Not as big as yours, but bigger that the largest size blogger offers. I tried out some tips and they did not work out for me. looks absolutely delicious ! lovely pic. mouth watering pics and u reminded our childhood days! Tried your menthe chutney and it was so good, Sup! Perfect with freshly made rice & ghee. Spread it on bread as a sandwich too. Very nice! Will try to post it today for T&T. I think we all hold similar school days memories..Me and now my son, my niece all are ardent fans of Chitraammu (tats how Akash spells it :D) he combined Chitanna with mammu ..it was a good read..
Hi Sia, I realized how much I have missed being away from blogging for one month after seeing your pictures. I so love them! The lemon rice is tempting, I make it often, but your picture is just perfect, though I don't like the fork next to it:D Lovely post with great memories from your childhood.